Daily lunches eaten out of the office can quickly add up! If you spend $10 a day for lunch during the work week, that’s $2,400 yearly that’s not in your pocket anymore. Of course, there are weeks when “sack lunches” just aren’t in the cards for you. There are days when, well-intentioned, you come to work with a homemade salad but your stomach is settling for nothing but a warm quesadilla from that place down the street. Maybe you’re hopelessly devoted to bringing your lunch to work, but the sight of one more boring sandwich is going to push you to your brink. Let’s work through this. There are many benefits to packing your own lunch to bring to work: making use of dinner leftovers, having control over which ingredients you use, experimenting with recipes, and yes, saving money! If you’re bored with your lunch routine, we’re here to inspire. All of these recipes are vegetarian, can be modified, and can be made the night before. If you’re fine with eating the same thing every day for a week, make lots and keep it in the fridge at work, then you can omit the word “lunch” from your thoughts until Sunday comes again. I like this one for so many reasons. If you love bread, eat it on bread. If you’re trying to go lighter or gluten free, use green leaf lettuce as a wrap. Heck, go wild, quarter a bell pepper and treat the salad like a dip! Once you have the ingredients for this recipe in your kitchen, all you need to buy to remake it (and you’ll want to) is the tofu. This tastes great when you let the ingredients get to know each other over night. If you have fridge space at your office, make your batch and leave it there, along with your bread, lettuce, etc. so you can enjoy it throughout the week without towing it back and forth. 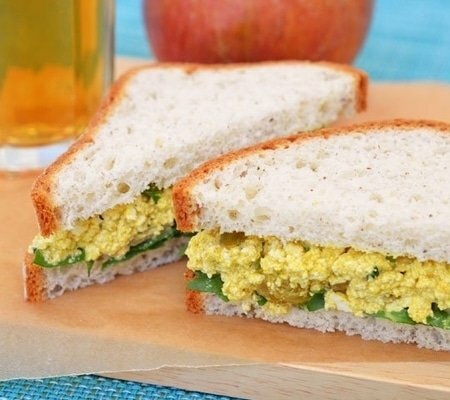 It’s easier than boiling, shelling, and mashing eggs for egg salad, but still gives you the fullness from protein. Mustard seeds make it extra delicious, and they are incredibly mineral rich. One teaspoon of these seeds contains 6% of your daily value of iron and calcium, 8% of magnesium, 9% of phosphorus, and 21% selenium! Wowza. 1. Put the raisins and mustard seeds in a small, heatproof bowl. Bring the apple cider vinegar to a boil and pour it over them. Let it them soak for ten minutes or more. 2. Rinse and drain the tofu and gently press it between towels to remove excess water. Place the tofu in a large bowl and roughly crumble it using your hands or a fork. Pour in the raisin, mustard seed, vinegar mixture, along with the pumpkin seeds, chives, and parseley. 3. In a separate bowl, mix the mayonnaise, curry powder, salt, and pepper. Add this to the tofu mixture and stir until everything is thoroughly combined. Taste and adjust to your liking! 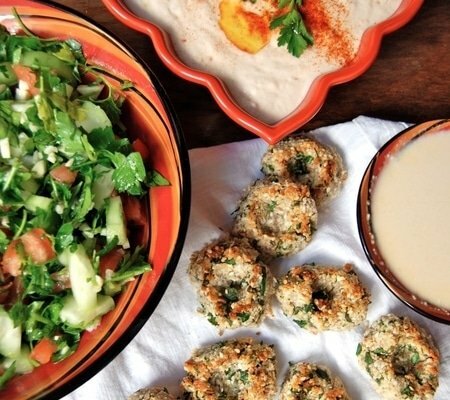 If making falafel at home intimidates you, I’m here to tell you it’s possible. You can make this recipe without a food processor, though it’s easier with one. It’s really convenient to make for a few reasons: there are many possible substitutions for ingredients you may not have on hand, you can make the mix ahead of time and cook it when you want, and it’s a great way to use that excess parsley and cilantro you inevitably find yourself scrambling to use before it goes bad. You also have multiple options for cooking these: dehydrate, bake, or fry. I choose baking because it’s the easiest and healthier than frying. When I make this recipe, I used bread crumbs instead of almonds because too many nuts make my stomach churn and it also keeps the cost down. I didn’t soak the walnuts and it turned out great. -tahini or red pepper dip to top! 1. If using a food processor, blend walnuts, dates, and almonds/breadcrumbs, and egg. If not using a food processor, use your other devices to mix these puppies up. 2. Transfer nut mixture to a mixing bowl and add the rest of the ingredients. Mix by hand. 3. You can keep this mix in the fridge for a couple days or cook right away. When you’re ready to cook, form half-dollar-sized balls and press your thumb into the center. I like baking these in mini muffin tins to form cylindrical patties. Fry: Use heat stable oil such as peanut or coconut. Fill your pan with enough oil to cover half a patty. Fry on each side until golden brown. I really like the image of spending a quiet Sunday afternoon over a pot of soup-to-be, then waking up Monday knowing that your souper healthy lunch is already ready to go. This recipe is full of vegetables and healing spices and (like all soup…) is easy to reheat whenever you're ready to enjoy it! Freeze it so your future self can get down with some lentils, too. 1. In a large soup pot, saute onion, carrot, and garlic in olive oil. Add spices once the onion is translucent and saute for a few minutes more. 2. Add vegetable broth, tomatoes, and lentils and simmer for 30 minutes. 3. Add lemon, parsley and cilantro just before serving. Optionally, add an extra slice of lemon over each bowl. We may not be able to hire you an at home chef, add hours to your day, or get you a job with one of those start ups that provides free lunch, but we hope you will except our small gift of these recipes. Did you try any of these recipes and love them? What your favorite vegetarian lunch recipes? We'd love to know! 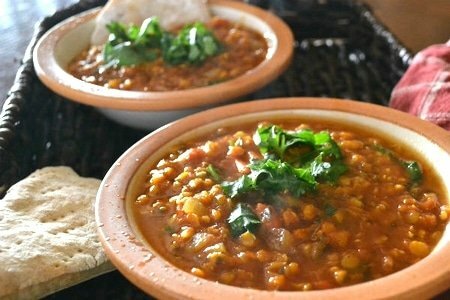 I tried the Morrocan Lentil Soup and really loved it! Thanks so much! Why are you showing 3 supposedly healthy vegetarian recipes and then showing a picture of the ingredients on white bread? I do not understand the latest trend to attempt to convince people that are eating healthy while promoting white bread!